This blog is dedicated to the Dede puppets, a bunch of distinctive art puppets that burst into my life around Christmas 2011 and made themselves very comfortable. I am simply telling the stories of our life together. We really appreciate comments and we even might incorporate those into our stories. Though I have to apologise when the reporting becomes erratic at times. It is simply me (one) vs them (64 at the last count) :). 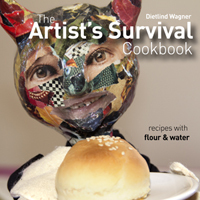 For all those who want to support the Dede puppets, you can buy the Artist’s survival cookbook. A book full of recipes made from flour and water. It is ideal for anyone who wants to avoid artificial flavours or preservatives in their staples (or are on a tight budget). Presented in a light-hearted manner by the one and only Dede puppets. It is not specifically written for kids, but all recipes are simple and can be easily followed by children or even better, prepared together. 114 full colour pages. Buy it on CreateSpace or Amazon. Not sure? download a sample pdf from Createspace. The first Dede puppet ebook The Super Dede Competition is now available on Smashwords. The extraordinary talent show was performed on this very blog with the input of the blog readers. The readers selected five puppets to become contestants and subsequently voted who performed best and would be crowned the Super Dede. Now, Larry, you will find yourself this book. Thanks for the great contributuion Mr XL. :). 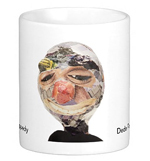 Last but not least, you can buy Dede puppet paraphanelia on the Dede design zazzle store. If there is any Dede picture from the blog or Intagram you want to have printed on a zazzle item, email me and I am happy to oblige. If you want to be updated daily, follow us on Instagram. We also have a facebook page, but we struggle with that one :). Cool idea, such a creative aren’t u! Exciting. My first comment. Thanks Chris. Like the idea of satirising social networks – nothing quite like those traditional f2f friends eh? Perhaps (unlike some people) we know, or can remember, how to communicate in the real world with flesh and blood people…. Thanks Deidre. . Love my f2f friends. With all the online stuff, time is even more scarce, but nothing beats catching up with people for real. The new puppet reminds me of Mark Sainsbury with his brown mustache and slightly bigger head. Maybe the puppet is a TV presenter. Yes, an Announcer who takes himself very seriously. Or somebody who knows everything maybe? I feel honoured that you came out of the woodwork for my dede puppets! You are right, Lurker sounds negative and devious. I feel a new puppet coming on. thanks for the like. interesting concept your blog. best of luck. glad you like them. keep it up. Congratulations on the book launch. Awesome event and so glad the dedes were in fine form and enjoying themselves! So creative! I love it. Awesome post. So glad we found each other :) I am eager to follow and see what you and your puppets will be up to next. Cheers! Thanks so much for your comment, Gina. Those things are kinda creepy, but pretty cool at the same time. Sort of reminds me of my ex-wife before we got married. Great blog, I look forward to reading more of it and your new posts. Thanks. I finally started on some new ones today. Hi Dietlind! Ich finds wunderbar!!!! Weitermachen! Ich bin sehr beeindruckt von den Arbeiten und der Idee. g r e a t w o r k! everyones a unique! congratullation out from the deep south of austria! Vielen Dank! Von der anderen Seite der Welt! habe ebend deinen “Schop” angesehen: http://www.zazzle.de/dededesign – super idee! gibts eigentlich keine T-Shirts und schickst du auch nach Zürich? Das wird alles in Amerika hergestellt und dorthin geschickt wo du es haben willst. Ich arbeite gerade an einer Tshirt Serie und hoffe, dass ich nächste Woche die ersten fertig habe. Ich brauche selbst ein warmen Hoodie für den Winter, der ja wieder vor der Tür steht. Freu mich auf deine Email.